This Magento 2 extension provides integration of social media like Facebook and Twitter to your website. 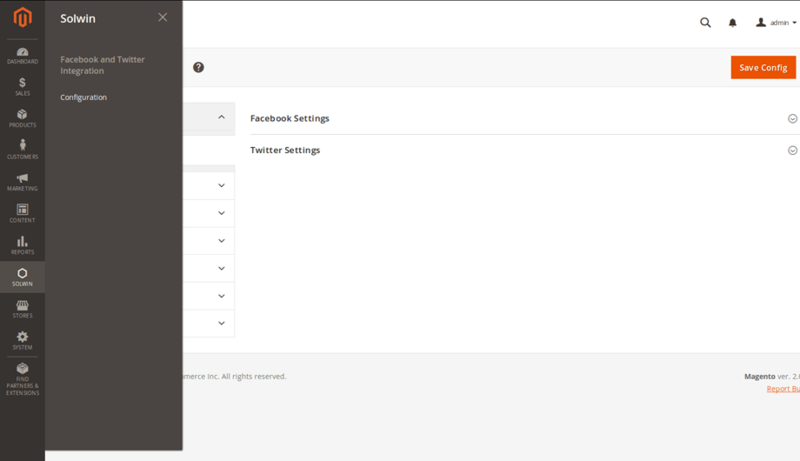 It also provides more configuration options for both social media. 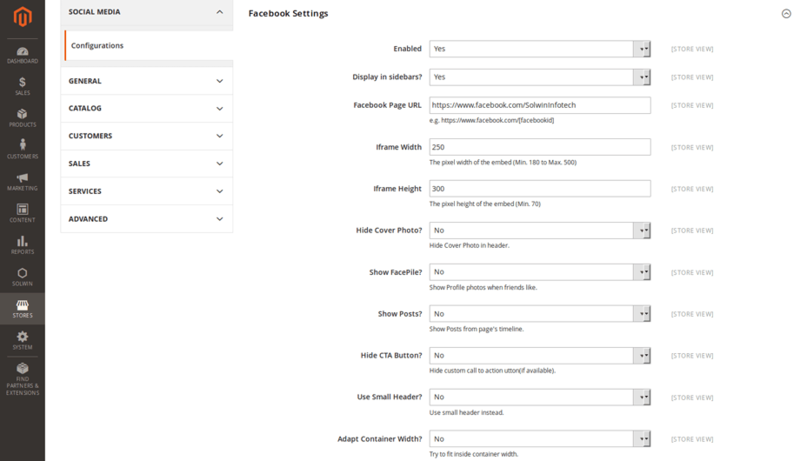 Facebook integration provides many configuration options like width, height, enable facebook post, show/hide cover photo, show friend faces, etc. And Twitter provides No.of tweets, Follow us on twitter link, enable twitter block at any place. Admin can easily integrate Facebook and Twitter block with any static block, CMS pages, left/right sidebar, phtml file etc. Manage and display number of tweets on frontend with good presentation style. 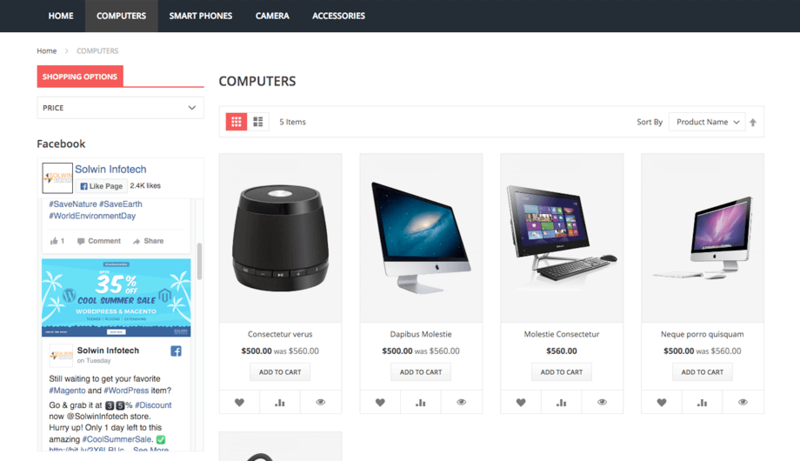 Easy to add in CMS page like block and showcase social media feeds. Easily showcase enable/disable in left or right sidebar. Keep your customer updated with recent social media news and offers. Download the Facebook and Twitter Integration extension .ZIP file from solwininfotech.com using your Solwin Infotech website account. If you are using Magento 2.0.x then you need to extract solwin-socials-m2-2.0.x.zip file. If you are using Magento 2.1.x then you need to extract solwin-socials-m2-2.1.x.zip file. If you are using Magento 2.2.x then you need to extract solwin-socials-m2-2.2.x.zip file. If you are using Magento 2.3.x then you need to extract solwin-socials-m2-2.3.x.zip file. If you are using Magento 2.1.x then you need to extract solwin-socials-m2-EE-2.1.x.zip file. If you are using Magento 2.2.x then you need to extract solwin-socials-m2-EE-2.2.x.zip file. Now, you can see the Solwin menu in admin panel. Please go to Solwin -> Facebook and Twitter Integration -> Configuration and select Enable to Yes. This extension will help you to drive more of your visitors attention to your best, most profitable products.